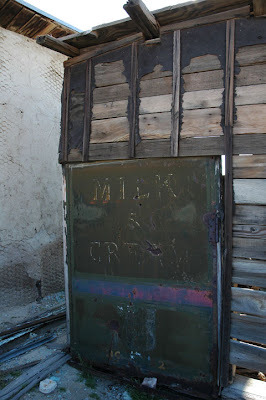 As a fan of ghost towns, I have spent a considerable amount of time investigating the old mining camps of the Mojave Desert. If there is one constant in their construction, it is the ubiquitous reliance on tar paper to seal the gaps between the boards. Usually on the interior between the studs and siding as a barrier against wind, the most modest structures often have the tar paper as an exterior sheath. When immigrants came to America, they could stake a claim to a piece of land by living on it for three years. 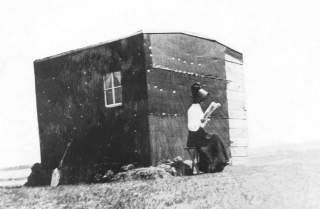 Mina Westbye (1878 - 1969), pictured, lived for three years in this little shack on the Dakotan plains. Her plan was to sell the land once it was rightfully hers, and invest in equipment to become a professional photographer, but in the end it didn't turn out that way. Of 700 000 thousand emigrants from Norway to the US, 400 gave their profession as "photographers", over one third of these were women. Though many ghost towns have been scrapped and burned down by scavengers and squatters, there are still examples that are very accessible. 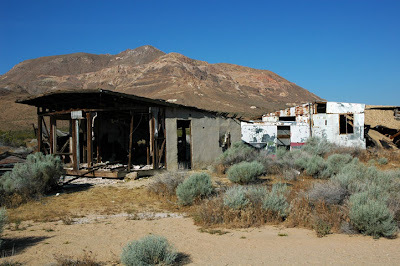 This little encampment is right at the side of the road and mere mile off Highway 14 as you approach the town of Mojave. It seems the leftmost corner is holding the whole thing together. 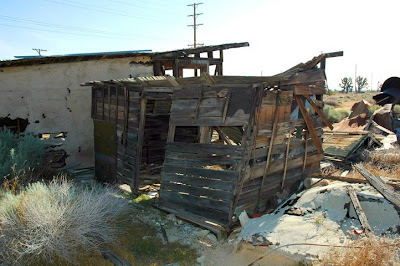 Homesteading laws varied regionally, but in the Mojave there are still communities of inhabited shackitecture cabins that were built when you could claim 2.5 acres if you built and lived in a structure. As discussed on D+R previously, the local zoning and building departments represent an impregnable, byzantine bureaucracy so difficult to navigate that it often becomes an insurmountable obstacle to amateurs. Of course, those departments do a terrific public service that is necessary for civilization to continue, but I think there is a possibility to refine and streamline these departments to serve individuals. There are communities dying from lack of investment, dwindling population, dying industry and a diminished tax base. Imagine a progressive rural community that opened a shackitecture/homesteading office - a building department that didn't tell you what you can't build, but what you can build. 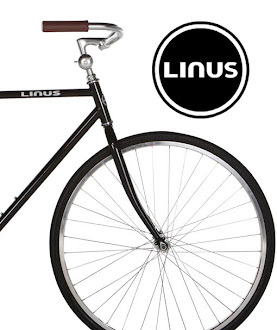 How would it work? Shackitecture Zoning/Building Framework for Homesteading - A community building department would draft a set of standards and conditions that provide a framework of opportunity for very modest off the grid homes. It would combine building and zoning standards to specifically address what is possible. For example, no more than 400 square feet, no more than 20% lot coverage, solar only, no electrical hook-up, gray water, composting toilet, stick construction, foundation requirements, etc. This would allow a holistic view of what is possible if you are willing to make serious concessions like providing your own power. Public/Private Colab - Private companies would respond to this framework creating plans and kits that conform to the regional shackitecture standards. These companies would work with the shackitecture office, get inside the spirit of the framework, determine a maximizing approach to build what is possible, construct an example house and market kits and plans to build similar. Of course, individuals could work with the shackitecture office directly and create their own plans, but if you are willing to build a standard, already approved shack, it would be wildly more efficient as the battles will have already been fought. Individual Responsibility - Before spending a dollar, an individual could approach the local shackitecture office and say, "I want to build Shackitecture, Inc.'s Plan B on this 5000 square foot lot." As they have already approved the plans in concept, they would pull the flowchart for Plan B and work through the restrictions and requirements flowchart. Does it cover less than 20% of the lot? Is the lot residentially zoned? Is there a brush fire danger? Et cetera. When it is determined that building is possible, the shackitecture office would hand the shackitecture enthusiast a sheet explaining what needs to be done next to get Plan B approved. Hire an engineer to spec the foundation, hire a draftsman to create a site map, and so forth. The approach would not circumvent zoning/building, but would provide a reasonable path to work through it. Approved Building - As with any building project, there would be inspections to assure that the plans are followed in a safe and sane way. And, if the plans are followed according to Shackitecture Inc.'s DVDs, it should be a breeze. Free Land - For these dying communities, what if you gave people an acre? Build a structure, occupy it for five years and get the title to the land. City - Sure, you will not be able to homestead in Manhattan, but what if the shackitecture model was expanded to include cities that are teetering on the brink. Rather than tiny desert homes, what if there was a list of 20 approved 400-900 square foot homes that could be built on any one of the cities' pre-approved R-1 lots that were at least 2000 square feet? And the city split big parcels of land into 2000 square foot lots, financed the land, built narrow roads with wide bike paths and stubbed out utility/sewer at the property line? In return, the homeowner would agree to generate 20% of their own power, have solar assisted hot water, commit to all Energy Star appliances, plant three fruit trees, build two raised vegetable beds and install a clothesline. Federally Funded - You can create power or you can save power. With all the talk of federally funded green power initiatives, what about saving power? This could be a regional/federally funded program. The ownership society is a noble idea and it doesn't have to mean adjustable mortgage loans for McMansions on the outskirts of the suburbs. Quixotic? Perhaps. But this is within reach. When we talk about the trillions spent to prop up our faltering country, this is the type of investment that will build tomorrow. Think of the communities that would be created. I thought I was just going to write about tar paper this morning.